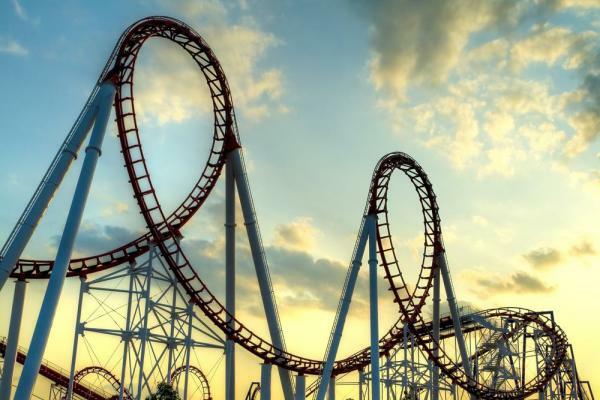 The US wine industry is perched precipitously atop a rollercoaster – on one of those tummy-turning peaks where you can’t see over the front to anticipate which way you’re lurching next. Most people I speak to in the wine industry are filled with dread, have triple-checked their seatbelt straps and are defensively wedging themselves into any seemingly safe corner they can garner. Wine buying is changing in the US. Fast. Furthermore, it’s changing in many regards, and that is disconcerting to almost everyone on the trade side. The good news is that we’re still drinking. Or rather the 40% of Americans who are of legal age amd drink wine still are. The International Wines and Spirits Record (IWSR) reports that US wine consumption was up 1.7% in 2017. That means we American imbibers hit our 25th-year of volume growth in 2017. (“Clink, clink!”) Mind you, only 35% of US adult wine imbibers drink once a week or more, according to the Wine Market Council. Maybe that is in part why scan data shows we are slowing our still-increasing wine consumption rate. Could core US consumers be reaching their reasonable maximums? I wish we could know what non-scan data sales were. Considering the current political climate in the USA, it is deeply dubious that we are drinking less in volume. Considering this context, I wouldn’t blame fellow imbibers for turning to the stronger stuff, but most of them are reaching for a craft brew instead. (At least they’re still sipping.) So, where are things looking up for wine? Higher-end sales would seem to be a sunny spot on the horizon, given that some of our upper crust have just received significant tax cuts. Moreover, interest in top shelf wines is not new. In 2017, premium wines accounted for 22% of sales, as opposed to only 2% in 1990, constituting an 11-fold increase. Well, “premium” is a slippery term when applied to wine prices. Danny Brager at Nielsen (a company that tracks scan data) reported that 2017 marked double digit growth in the $15-$19.99 arena, which is technically “premium” in wine price classifications. (We all prioritize our budgets differently, but my “everyday” wines are $15-$30. While entirely pleasant, I don’t feel those are really “premium”.) Yet, 78% of bottles sold on the US market are priced at $10 or less. While Nielsen reports that sub-$8 per 750-ml bottle wine sales are dropping, that category still comprises a whopping 55% of the market. The scenario reminds me of one of my high school chemistry teachers who urged my class not to question the relevance of truth but always to question the truth of relevance. So, while it is significant to look at what different wines the US is buying, it is just as important to look at how we are buying those bottles. Speaking as an insider, the wine industry largely feels stuck in its old ways, limited to selling wines through restaurants, brick and mortar retailers and occasionally online. Yet consumers’ changes in retail consciousness pervade everything from comestibles to shampoo. This is particularly true in major metropolitan areas. I walked into one of my local wine stores just yesterday and heard the owner moaning to a sales rep, “This is New York City. Everything has to come with a delivery option!” Let’s be grateful that for now Amazon still hasn’t infiltrated the US wine market successfully. Despite the fact the US alcohol laws hold a ferociously tight rein over our much-loved liquids and how they are shipped interstate (in the case of online buyers), we are starting to buy wine very differently today. We used to slake our thirsts by heading down to the bricks and mortar store. Many of those “liquor” or “package” stores still hold their grounds, at least when there isn’t an alternative at a well-curated, local wine and spirits shop. In their grandest forms, retailers can be massive discount warehouses set off highways. Good luck finding an (available) well-informed opinion in those structures, but their prices might be kind enough that you’ll forgive a few less-than-what-you-hoped-for bottles. Maybe it works out in the wash, but the choices come down to an impersonal balance of labels and points (maybe) and prices (certainly). To access drinks the old school way, we must shop in advance. But now, thanks to our insatiable thirst for immediate satisfaction, new resources have arrived. With everything from smartphone apps to restaurant and grocery delivery services, the avenues of availability have grown. Due to the mounting stiffness of competition, convenience and price have become of paramount importance. However, they often don’t work hand in hand. Ironically, while many of us have an eye on our last red cent, we’re often ready to pay for convenience, especially we city dwellers. We can’t have our wine and drink it, too, but we have to get the wine in the first place. Just tap into booze delivery service apps Drizly (69 US cities) or MiniBar (36 US cities, including all the boroughs of NYC.) These services deliver within an hour or two from your local wine shop. (Mind you, as Patrick Watson of Brooklyn’s Smith & Vine (which does not participate in them) pointed out, they take a nice chunk of the sale profits out of the local wine stores’ pockets.) Being the take-out and delivery service junkies that we are in the Big Apple/Big Bagel/City That Never Sleeps, so many of us have wished for wine to be delivered alongside our fave foods. These options aren’t far from that. For those graduating from delivery (or microwave) dinners, threee meal kit services are now readily available. I’ve tried Blue Apron and Hello Fresh. Both have wine programs, and you don’t have to reside in a major metropolitan area to subscribe. I’ve tried both, and though I think Blue Apron’s 500 ml bottles are terrific for weeknights and lighter drinkers, like so many of the offerings circulating via wine clubs these days, the wines are confected, alcoholic and – more often than not – genuinely terrible. Moreover, the wines often don’t meld well with the dishes. One of the most important aspects of these nouveau retailers or retail-connectors is that people are shopping differently. Drizly’s website claims that 60% of its orders are placed on their app. Their average shopper age is 32 years’ old. As the service expands, I wouldn’t be surprised to watch that age increase. Typically, the older we get, the less time we have yet the more money we have to splurge on convenience. Circling back to the major retailers, many are feeling the squeeze. Unlike smaller scale, local wine stores, the big players often need to sell on price reduction. The former tend to service the “I need a wine for dinner tonight” clientèle and can offer highly customized advice face-to-face. The latter shopping experience, whether the consumer is stepping into a store or clicking online, can feel more commoditized. When a consumer feels she could spend the same coin anywhere – and this applies as equally to wine as it does to camping gear and patent leather shoes – price becomes more critical. The US consumer has been trained for decades to wait to buy on sale. The deeper the discount, the more pleased the customer will be. The satisfied customer learns to wait for the next big sale. For retailers, this mean tighter margins and less predictable cash flow. The retailer learns the customers’ behaviors and discounts more frequently or more deeply. The grip of consumer greed tightens. These days there is a sale every day. Previous post: New Zealand Sauvignon Blanc: too much of a good thing?